"Mirgab V" is the largest aluminium motor yacht launched by Berger Boat Company in its 143 year old history. The super yacht entirely designed and built by the American shipyard for a wealthy Kuwaiti family has three decks and a flying bridge. The styling is classic, the furnishing aboard is classic yet modern with a lot of Makoré wood panelling directly from Africa and marble from Italy, supplied by Bigelli Marmi. One of the characteristic features of the interiors is the pneumatic lift for use in between decks. It is built of glass and shaped as a tube of a metre in diameter which runs inside a ladder. The ladder crafted by Les Metalliers Champenois, has steps covered in onyx for a total of about 100 sq. metres and is finished in engraved bronze and embellished by a sophisticated play of lights. 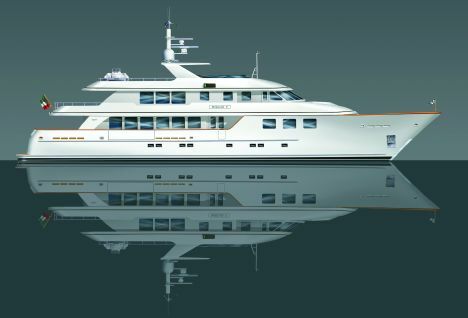 "Mirgab V" has a semi displacement hull and is powered by twin MTU 12V 4000 engines that effectively ensure the declared maximum speed of approximately 20 knots. How the deck layout measuring more than 750 sq metres will be distributed has not been disclosed yet but it is presumed that it will be divided into cabins for guests and crew quarters below deck. The yacht owner's master cabin, saloon, dining area and galley above. The wheel house will be installed on the upper deck together with areas dedicated to relax and leisure activities. Open air activities will instead be situated between the cockpit and flying bridge area. The new super yacht signed by the Berger Boat Company will be based in the Mediterranean and on the French Riviera on the south coast of France. It is likely that it will be exhibited at the next Monaco Yacht Show.